I couldn’t help but cry. No matter how many times I witness one, it still scares me—pains me—to see him stiffen and fade, convulse and pale, his lips and fingers becoming the lavender of death. “He’s acting weird,” his nurse Barbara said to me just before feeding him while I stood in the next room washing up dishes. Moments later she called us in, “He doesn’t look good,” she said, and we all knew, what with that familiar frightened look on his face, he was beginning to seize. Then she told me he had a bite of food in his mouth, so I went in and, with a hooked finger, fished it out as best I could, conscious of the fact that, at any time, he could bite down hard. Though I’d been careful, I inadvertently pushed an unreachable morsel into the back of his throat. Calvin became bluer than I’d seen him turn in a while, convulsed more, too. I feared he’d choke on the bit of food, so Barbara patted his back firmly and counted off the minutes. 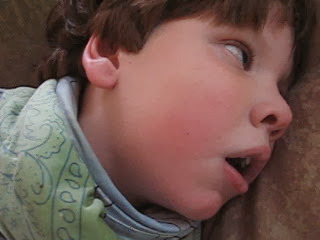 Finally, he took a breath, then flinched and lurched forward a bit, indicating to me that he was in the third and final stage of the seizure. Barbara switched places so I could be near his face, while Michael stood slightly back and held the fort, kept us grounded. As the world came back into Calvin’s eyes he quietly said, “Uh-uh,” his way of saying, Mama, and I wondered how he felt or if he was scared. When it was well over I spooned in his meds. Michael carried him upstairs, changed his diaper and tucked him in to bed. Weeping, I said to Barbara, “I love you,” and told her how kind, smart, compassionate and loving she was. “You are too,” she said as we embraced, our little Calvin already asleep under his canopy, under our watchful eyes and ears, under a waterfall of tears and a sky full of stars to wish upon. I don't know if we've talked about this, yet, but have you ever tried some of the startle techniques outlined in the book "Epilepsy: A New Approach?" Over the years, we have successfully intervened many times when Sophie "got that look" and either firmly grasped her by the shoulders and shouted NO! or even turned her head the opposite way. It sounds harsh, but we have seen really big seizures diverted or lessened, and while it doesn't always "work," or we don't do it in time, I recommend you try it!